Life Science (therapeutics- drugs to cure or manage diseases, diagnostics- tests and devices to find diseases, devices to cure and monitor diseases; and digital health –health care hardware, software and mobile devices and applications streamline and democratize the healthcare delivery system) is in the midst of a perfect storm of decreasing productivity, increasing regulation and the flight of venture capital. But what if we could increase productivity and stave the capital flight by helping Life Sciences startups build their companies more efficiently? We’re going to test this hypothesis by teaching a Lean LaunchPad class for Life Sciences and Healthcare (therapeutics, diagnostics, devices and digital health) this October at UCSF with a team of veteran venture capitalists and angels. The last 60 years has seen remarkable breakthroughs in what we know about the biology underlying diseases and the science and engineering of developing commercial drug development and medical devices that improve and save lives. Turning basic science discoveries into drugs and devices seemed to be occurring at an ever increasing rate. Yet during those same 60 years, rather than decreasing, the cost of getting a new drug approved by the FDA has increased 80 fold. Yep, it cost 80 times more to get a successful drug developed and approved today than it did 60 years ago. 75% or more of all the funds needed by a Life Science startup will be spent on clinical trials and regulatory approval. Pharma companies are staggering under the costs. And medical device innovation in the U.S. has gone offshore primarily due to the toughened regulatory environment. At the same time, Venture Capital, which had viewed therapeutics, diagnostics and medical devices as hot places to invest, is fleeing the field. In the last six years half the VC’s in the space have disappeared, unable to raise new funds, and the number of biotech and device startups getting first round financing has dropped by half. For exits, acquisitions are the rule and IPOs the exception. While the time, expense and difficulty to exit has soared in Life Sciences, all three critical factors have been cut by orders of magnitude in other investment sectors such as internet or social-local-mobile. And while the vast majority of Life Science exits remain below $125M, other sectors have seen exit valuations soar. It has gotten so bad that pension funds and other institutional investors in venture capital funds have told these funds to stay away from Life Science – or at the least, early stage Life Science. WTF is going on? And how can we change those numbers and reverse those trends? We believe we have a small part of the answer. And we are going to run an experiment to test it this fall at UCSF. In this three post series, the first two posts are a short summary of the complex challenges Life Science companies face; in Therapeutics and Diagnostics in this post and in Medical Devices and Digital Health in Part 2. Part 3 explains our hypothesis about how to offer our hypothesis how to change the dynamics of the Life Sciences industry with a different approach to commercialization of research and innovation in this sector. And why you ought to take this class. There are two types of drugs. The first, called small molecules (also referred to as New Molecular Entities or NMEs), are the bases for classic drugs such as aspirin, statins or high blood pressure medicines. Small molecules are made by reactions between different organic and/or inorganic chemicals. In the last decade computers and synthesis methods in research laboratories enable chemists to test a series of reaction mixtures in parallel (with wet lab analyses still the gold standard.) Using high-throughput screening to search for small molecules, which can be a starting point (or lead compound) for a new drug, scientists can test thousands of candidate molecules against a database of millions in their libraries. Ultimately the FDA Center for Drug Evaluation and Research (CDER) is responsible for the approval of small molecules drugs. The second class of drugs created by biotechnology is called biologics (also referred to as New Biological Entities or NBEs.) In contrast to small molecule drugs that are chemically synthesized, most biologics are proteins, nucleic acids or cells and tissues. Biologics can be made from human, animal, or microorganisms – or produced by recombinant DNA technology. Examples of biologics include: vaccines, cell or gene therapies, therapeutic protein hormones, cytokines, tissue growth factors, andmonoclonal antibodies. The FDA Center for Biologics Evaluation and Research (CBER) is responsible for the approval of biologicals. The drug development pipeline for both small molecules and biologics can take 10-15 years and cost a billion dollars. The current process starts with testing thousands of compounds which will in the end, produce a single drug. In the last few decades scientists searching for new drugs have had the benefit of new tools — DNA sequencing, 3D protein database for structure data, high throughput screening for “hits”, computational drug design, etc. — which have sped up their search dramatically. 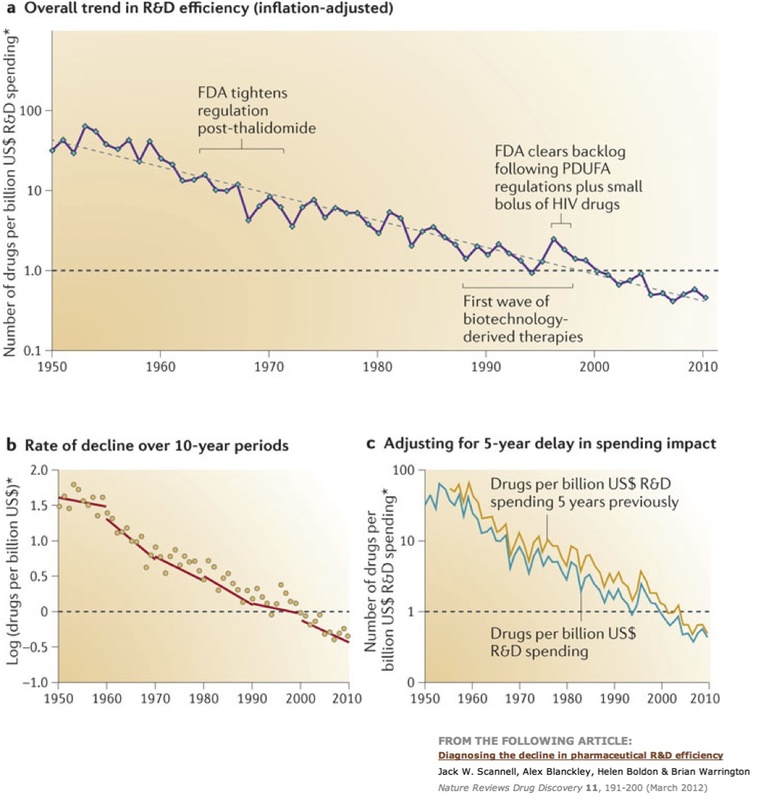 With the exception of targeted therapies, the science and tools haven’t made the drug discovery pipeline more efficient. Oops. There are lots of reasons why this has happened. Drug safety is a high priority for the FDA. To avoid problems like Vioxx, Bexxar etc., the regulatory barriers (i.e. proof of safety) are huge, expensive, and take lots of time. That means the FDA has gotten tougher, requiring more clinical trials, and the stack of regulatory paperwork has gotten higher. Additional trials to demonstrate both clinical efficacy (if not superiority) and cost outcomes effectiveness are further driving up the cost, time and complexity of clinical trials. The belief was that basic research + mass screening would make the drug discovery pipeline more efficient. That’s hasn’t happened. There’s still a debate about why high throughput computer automated screening – going from “hits to leads” – isn’t producing better than the manual animal-based screening it replaced. Biologics have a 2 ½ times higher success rate in clinical trials than small molecules. In a perfect world the goal is to develop a drug that will go after a single target(a protein, enzyme, DNA/RNA, etc. that will undergo a specific interaction with chemicals or biological drugs) that is linked to a disease. To get FDA approval new drugs have to be proven better than existing ones. Most of the low-hanging fruit of easy drugs to develop are already on the market. 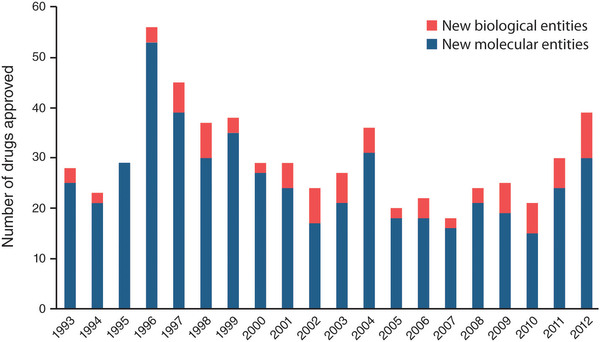 For the last two decades, biotech venture capital and corporate R&D threw dollars into interesting science (find a new target, publish a paper in Science,Nature or Cell, get funded.) The belief was that once a new target was found, finding a drug was a technology execution problem. And all the new tools would accelerate the process. It often didn’t turn out that way, although there are important exceptions. In Part 2 of this series, we describe the challenges new Medical Device and Digital Health companies face. Part 3 will offer our hypothesis how to change the dynamics of the Life Sciences industry with a different approach to commercialization of research and innovation in this sector. And why you ought to take this class. The author has the metrics on the financing status down pat. Shiboleths aside: big pharma, big medicine, big fda, big academia are the problem. eliminated heart attacks in Thalassemia kids about the same time. The fraudsters in genetics have been telling us the big breakthrough is just one more grant away when most of the adaptions they are cataloging are probably downstream from the epigenetic pathologies.